LONDON, England (CNN) -- It can often seem like hard work keeping track of the changes happening to our planet. Another day, another new prediction. Another week, another warning. It's enough to make even the most conscientious climate change student issue a weary discombobulated sigh. 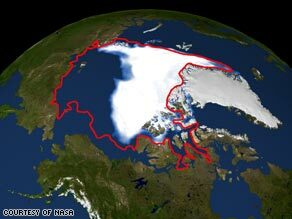 According to NASA, the Arctic sea ice minimum has reduced by 38 percent since 1979. Well, fear not. Scientists at NASA, along with a dedicated team of their designers, programmers and researchers, has put together one of the most stimulating, most thorough climate tracking sites you'll find anywhere on the web. Global Climate Change, NASA's Eyes on the Earth provides up-to-date -- up to the minute in some cases -- information about how the planet is changing in a detailed and engaging format with graphs, tables, reports and interactive features which are easy to find, follow and understand. Randal Jackson, the Web site's producer told CNN: "What we really wanted to do was to give people a visual presentation that wasn't so heavily reliant on text and also give some indicators that are highly visual, giving an immersive experience about what's going on with the planet." Coordinated by NASA's Jet Propulsion Laboratory and the California Institute of Technology, the Web site is designed to be interactive so people can explore a multitude of climate science issues. One of the most impressive functions linked to the site is the Climate Change Machine which allows users to peer into the recent past of changes that have happened to the climate including annual CO2 emissions and average global temperatures rises. Users can also spool forward to see how rising sea levels might affect coastal regions in different regions of the world -- it's alarming to see what just a one meter rise could mean. "While the sea level rise doesn't sound like a huge amount -- 0.4 millimeters per year change -- what you see in the Climate Time Machine is that even small changes at sea level can actually make a dramatic difference for humans," Jackson said. Another sobering graphic charts the disappearance of Arctic sea ice -- 38 percent of it -- from 1979 to 2007. Back on the main page, you can access more information about causes, effects, uncertainties and solutions as well as seeing what missions NASA are currently undertaking. In January 2009 NASA launch their Orbiting Carbon Observatory which Jackson says will stream directly to the Web site giving more accurate data on CO2. For new visitors Jackson says the Key Indicators toolbar is probably a good place to start. It gives a snapshot of what's going on at any particular point in time. "The indicators are based on data from satellites that are observing the planet right now," Jackson explained. "For example, we update the sea level figures and CO2 emissions monthly and changes in the ozone hole are updated daily." If all this doesn't give you enough of a climate fix, you can also download a widget to your desktop and check what's happening on a daily basis. "Our overall goal," Jackson said, "is to engage people by giving them a real time look at the vital signs of the planet."